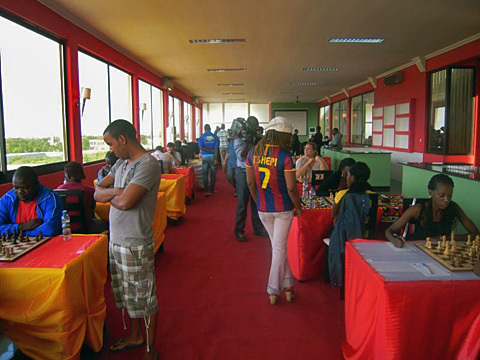 Alina L’Ami wrote a glowing ChessBase report of the 4th Taca Cuca tournament being held in Luanda, Angola. The tournament boasts nine Grandmasters and this is exactly what is needed to provide African players more chances for norms. 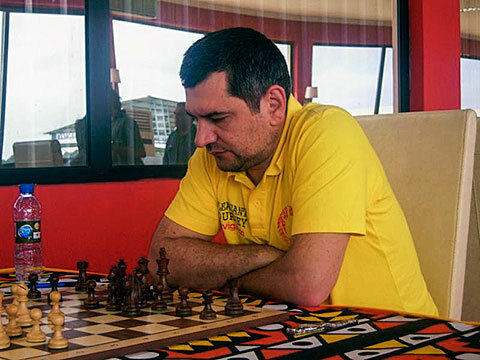 Along with top-seed Viktor Bologan (2687, Moldova), you have Grandmasters Sergey Tiviakov (2673, Netherlands), Erwin L’Ami (2611, Netherlands), Alexander Fier (2599, Brazil), Ahmed Adly (2596, Egypt), Maxim Dlugy (2518, USA), Sergey Kasparov (2503, Belarus), Thal Abergel (2474, France), Antonio Fernandes (2400, Portugal). 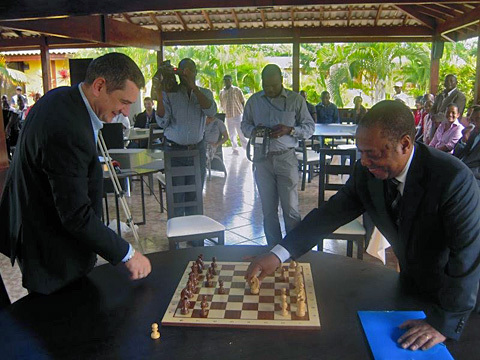 Ceremonial game between top-seed GM Viktor Bologan and The game between Dr. Jaime Aguinaldo, President of Angolan Chess Federation. Photo by Alina L’Ami. Unfortunately the top African players are not present, but FM Daniel Jere (2396, Zambia) and Stanley Chumfwa (2358, Zambia) will make a strong showing. Hometown favorite and top Angolan IM Pedro Aderito (2320, Angola) is in the field. It is a shame that more strong African players are not taking advantage of this opportunity. In the women’s section, 17 players will vie for top honors with WGM Alina L’Ami (2372, Netherlands) being the top seed and Portugal’s WIM Catarina Leite behind her. I followed the Dubai tournament. One day I hope to make it to Dubai to see that wonderful chess club. It is great to see Egyptians covering the entire globe. I hope to see them in Turkey. Go Ahmed! Egyptians chess players are not really covering the entire globe!! In Reykjavik 2012 Ahmed Adly did not participate unlike previous years [previously he defeated Magnus in a marathonic game, and in another year he defeated Fabio Crauna in a blitz game] ohh, old days… I think that they will participate in the Olympiad in Istanbul, can not wait to see Sami Shoker again striking GMs.. I can not find Angola open games, do you have any news for that…. Egyptians seem to be playing in all the continents. I was surprised to see Ali Frhat at the World Open in the U.S. I interviewed him in the Olympiad back in 2006. Games are always hard to get from African tournaments. No mention of games from Angola. Pedro Aderito has beaten two GMs. Top seed Viktor Bologan wins with 8/9! Sergey Tiviakov was second on 7.5/9 and Erwin L’Ami was third on 6.5/9. Catalina Leite of Portugal (left) won the women’s prize. 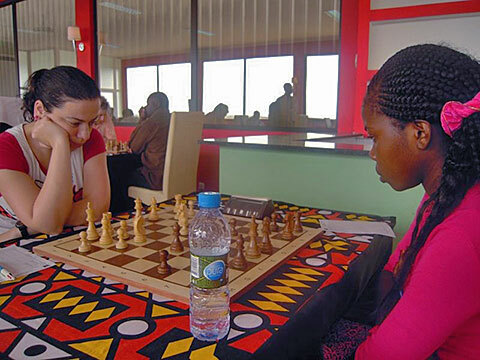 WIM Catarina Leite and WGM Alina L’Ami got joint first with 8.5/9, drawing with each other. LOL!!! I don’t know WHY I wrote that. I think Sokolov was on my mind for some reason. Thanks!! No games that I know of. One of the biggest drawbacks about covering events in Africa is the games are often not available. The often lack the staff to key in the games in a timely fashion. I’ll check to see if I can find any games.